The Inspiration: The first thing I think of when I think love is: my husband. I am married to the love of my life. He is my soul mate, my equal in the things that matter, and my opposite where it counts. He completes me. If I had to create something that said “LOVE” to me, I would have to be inspired by my own marriage to him. 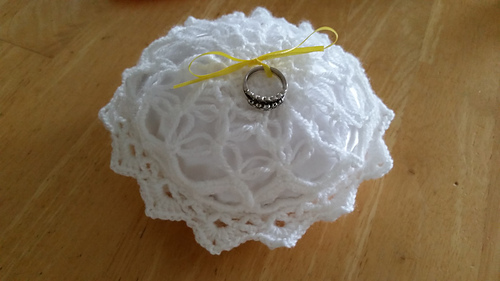 I wish I crocheted more during the planning of my own wedding because I would have loved to have created my own fingerless gloves and veil. I pined over the long, elbow length gloves, the petite little wrislets, and the long, flowing, white veils. But they were so expensive and I had not yet learned the value of DIY at that time. Of course, if this were my wedding, I would be showing you bridal photos with all my bridesmaids and my flower girl wearing the same elbow length fingerless gloves, or matching wristlets with long flowing ribbons, and the veil would be much fuller, and at least knee length with lots of embellishments. Alas, time was my enemy here, but I think I have captured what was in my mind’s eye. Materials: To create the Love is in the Air Wedding Veil and Glove/Wristlets, you will need an F hook, a tapestry needle for weaving in ends, scissors for cutting the yarn, a measuring tape to check gauge and a 3 inch metal or plastic comb commonly used for wedding veils (found easily and for very cheap online or at craft stores). The preferred yarn used in this project is Loops & Threads Woolike. It is a superfine or size 1 thread, but it has the feel and look of regular wool yarn. 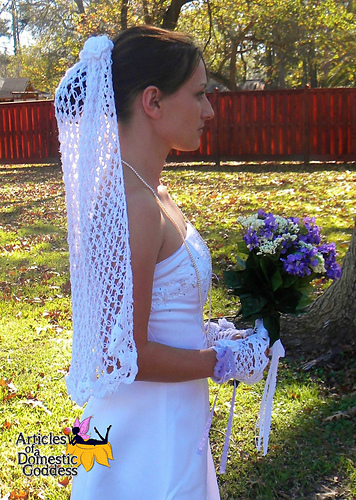 Length and Width Options: I have included in this pattern all of the options that a blushing bride would have at any bridal shop, because width, fullness and length of the veil and length of the gloves/wristlets really are personal preference. Brides, bridesmaids and flower girls come in all different age groups, heights, shapes and sizes. 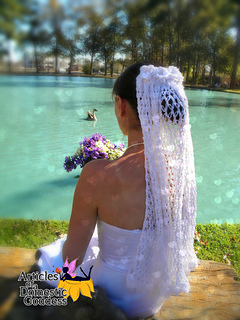 There is a modest veil width; which typically measures about 54 inches in width, (which I am showing you here) a moderate veil width; which typically measures about 72 inches in width, and a full veil width; which typically measures about 108 inches in width. There are photos depicting the process I used to attach the veil to the comb, which can be quite vexing, but I think I was able to simplify the process so that others can follow along easily. I also included options for creating a shoulder, elbow (shown here), waist, fingertip, knee, floor, chapel and cathedral length veil. The glove/wristlet pattern will accommodate all sizes of bride, flower girl or bridesmaid from toddler to large adult. I have included wrist width, arm length, arm width and some hand measurements for the toddler, child, small adult, medium adult, and large adult sizes included within the pattern, so that knowing which size group you fall under only takes a few measurements and any alterations to this sizing should only take beginner skills to accomplish. 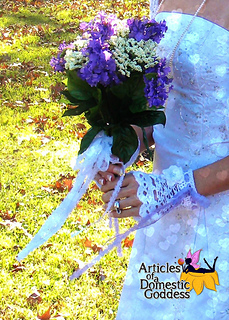 Embellishments: I only had the time to embellish my veil, gloves and writslets with a few flowers. I have included in this pattern 3 different flower sizes, with options for each to have leaves attached or not. Again, time is my enemy in this instance because if time were no issue or this were my own wedding, I would be showing you a wedding veil with embellishments not only at the top, but along the bottom along the large spaces in a lace fashion, spread evenly across the solomon’s knot space openings in random fashion across the veil, or lining the face along the side edging. My gloves and wristlets would be embellished heavily with flowers and my bridesmaids and flower girl might even have differing embellishments to show the personality of each lady. I have given ribbon lengths for each size for fitted ribbon ends or for long, flowing ribbon ends. Between the length, width, sizing, and embellishment options for both the veil and the gloves/wristlets, it really would be possible for many different brides, bridesmaids and flower girls to utilize these patterns and for no two sets to be exactly alike.